While we celebrate the hatching of our new red-crowned crane here at the zoo, our Partner for Wildlife Sergei Smirenski of Cranes of Asia reminds us of just how precarious the balance between habitat and population is in the wild. Recently he told us of a devastating fire that burned through 90% of Muraviovka Park, a protected area of critical crane habitat in the Russian Far East. The Amur region of Russia is an important nesting ground for the endangered red-crowned crane. Muraviovka Park was established in part to protect the diminishing wetlands which serve as a critical habitat for the crane, with an estimated population of only 2,700 left in the wild. Due to an ongoing drought, fires started by hunters or nearby farmers can present a potentially habitat destroying event that takes an already endangered species even closer to the brink. And that is exactly what happened on the afternoon of May 2 when smoke appeared on the horizon. According to Sergei, lunchtime brought about increasing winds and a fire line to the north. Fortunately, the fire was heading in the opposite direction of the breeding habitats and it was hoped the fire would pass without any damage to the park. But in the course of a minute the wind changed, and the fire that was headed away from the park turned to the east, with a direct line towards the wetlands, the breeding grounds, and the Cranes of Asia headquarters. Fires in the park are fought largely on the ground as there is no easy way to bring a fully-loaded water tanker into the wetlands. Within three to four minutes, the fire that was 7 kilometers away (approximately 4 miles), was within 300 meters (approximately 320 yards) of the headquarters, and moving fast. Volunteers were recruited to begin the fight, and eventually the fire was stopped within 50 meters of the house, camp, and cabins. In the course of the 5 hours the fire was burning, approximately 90% of the park was destroyed. The cranes that had just the week before become secretive about their nests because incubation was taking place were now walking among the burned out ruins aimlessly. Sadly, it was too dark, and too smoky to find the nests and save any eggs. This year promised to be one of the best breeding years ever, with more cranes, storks, rails, bitterns and other water birds than had been seen in the last 5-7 years. Yet despite the devastating fire, the park is beginning to return to normal. Grass has started peeking through the burned out ground, and it looks like two nests of red-crowned cranes, and two white-naped cranes may have been found. But the danger is ever present, and in order to help the cranes, their habitat, and our partner, we have offered to assist them with their prescribed burns to create fire breaks that would, in turn, protect the park from these sorts of events. If you can provide any support to the Muraviovka Park Fire Recovery Fund, it will help our Partner for Wildlife Cranes of Asia afford these basic fire-fighting needs, and help them to protect the habitat so necessary for these endangered birds. Please consider making a donation to the fund, or help spread the word by clicking on the “Recommend” button below to post this story to your Facebook network. Thank you for your ongoing support of the zoo and our conservation partners in the field. Crane photo by Hannah Letinich/Woodland Park Zoo. Field photos by Adam C. Stein/Cranes of Asia. If you've been to our Tropical Rain Forest building, you have no doubt been drawn to the lustrously-maned little monkey from Brazil, the golden lion tamarin. But did you know that these primates are ambassadors for one of the most well-documented and inspiring stories of conservation success in the wild? It goes back to the late 1970s, when population surveys conducted in tamarins' shrinking rain forest habitat located along a sliver of coastal Brazil discovered that these vibrantly colored primates were in severe decline: only 200-600 still existed in total and with the continued destruction of their habitat, their extinction looked imminent. But a consortium of zoos, including Woodland Park Zoo, banded together to captive-breed and release genetically diverse golden lion tamarins back into Brazil, along with creating habitat protection plans to ensure there would be places for them to grow their population. Woodland Park Zoo contributed one of the first family groups of captive-bred tamarins that were reintroduced into Brazil. Populations have also been recovered through translocation--moving wild tamarin populations that were otherwise doomed in tiny, fragmented forests into protected areas. As a result of these conservation efforts, the species was downlisted to Endangered from Critically Endangered in 2003. Currently, about one-third of the wild population descends from the reintroduction program. The reintroduction of captive-born golden lion tamarins has contributed significantly not only to the numbers living in the wild, but also to the protection of 3,100 hectares of forests within their range. Today, population surveys indicate the presence of more than 1,000 tamarins. While they still remain at risk, there is hope today for tamarins and we can all play our part by minimizing our impact on their habitat. Want to learn more? Go behind the scenes at the Tropical Rain Forest exhibit and meet the keepers with our upcoming Eye-to-Eye tour on July 24. 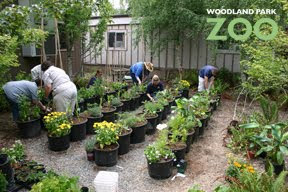 Did you ever wonder what it takes to provide food for the nearly 1,100 animals at Woodland Park Zoo? How does the zoo provide nutritionally balanced and natural diets that range from hundreds of pounds a day of hay for the elephants, oryx, gazelles and other animals to nettle leaf powder for our Partula snails? Where does it all come from? With nearly 300 different animal species, our staff works hard to provide all the animals with the opportunity to display natural behaviors, which includes replicating as closely as possible what they would eat in the wild. 1) what is the best, nutritionally balanced diet for this particular species? 2) are those foods available? 3) can we find this food locally? What is the impact on our carbon footprint? Are we always able to make all our food choices this way? Unfortunately not. Durian fruit and bananas aren't locally grown. Because animal nutrition comes first, we sometimes do have to reach further than our local vendors. We do, however, make every effort to reduce our carbon footprint, a task that, in the long run, also works in favor of our animals and the planet. Some food is cultivated right on zoo grounds in what we call "browse gardens": vegetables such as tomatoes, herbs such as rosemary and oregano, are grown in spots throughout the zoo, even at the administrative office area. But most of our food must be purchased. Our animals eat food that comes from the same sources that stock your local grocery, as well as food purchased from vendors who specialize in exotic animal diets from further afield. Still, we are always mindful of our carbon impact and alter diets or vendors to this end, but always with the animals in mind. For example, we recently changed our carnivore diet vendor (for the tigers, snow leopards, etc.) from on in the Midwest to one in California. 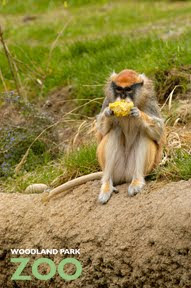 Reducing the distance food travels is one step in reducing carbon emission AND also saves the zoo money. As part of our Summer Experience, we're also encouraging visitors through a variety of programs to consider their food choices and sources, just like we do for our animals and at our "people food" dining options on grounds. We hope you'll join us in making smart, well-informed food decisions. Whenever possible, shop local farmers' markets, ask your grocer about where your food originates from, and, whenever you can, grow your own! 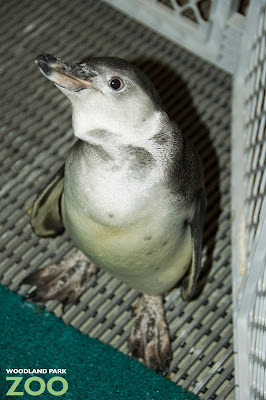 Eating fish and swimming around come naturally to our Humboldt penguin chicks. But to make sure they are getting the best possible diet and are comfortable and confident in their surroundings, our keepers are currently giving the chicks some one-on-one attention behind the scenes before they join the adults out on exhibit. The two oldest chicks, hatched April Fool’s Day and Easter Sunday, have lost their downy feathers and now have waterproof feathers for swimming. 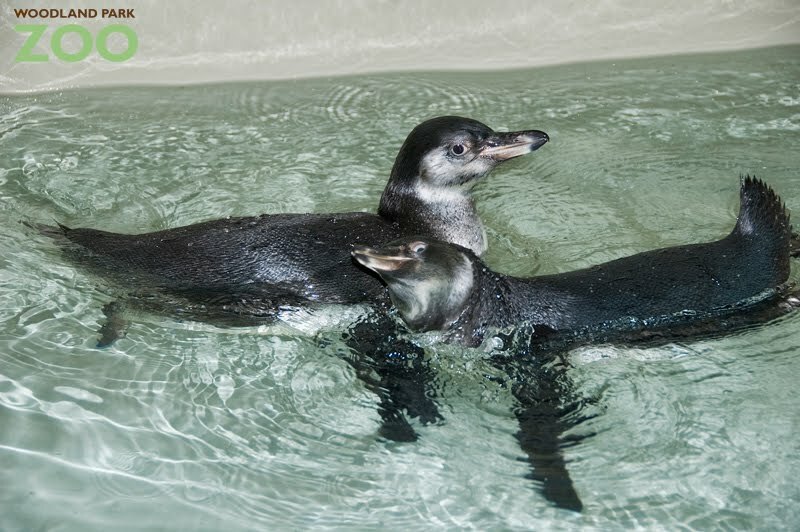 To get them used to being in water, the chicks have round-the-clock access to a shallow pool behind the scenes at the exhibit, where they can practice floating and swimming. 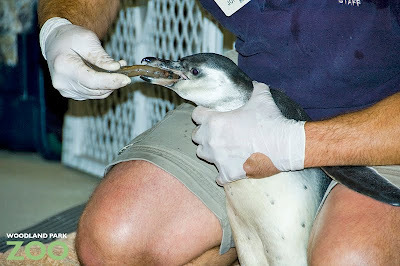 And while eating is no problem for these chicks, they do now have to learn how to accept fish directly from their keepers like all the adult penguins do. Hand feeding is especially useful because it allows the keepers to keep track of just how much each bird is eating as well as ensuring that each individual receives their vitamin supplement. With a little more training and practice, the two oldest chicks should be ready to join the adults on exhibit in late June. They’ll be fairly large but you’ll be able to distinguish them from the adults by their lighter, more grayish plumage. The three youngest chicks are just about to start their training next! 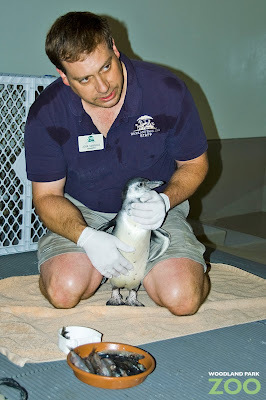 Photos by Hannah Letinich/Woodland Park Zoo. You can call the meerkats cute, you can call them curious—and soon, you can call them by the names that you give them. 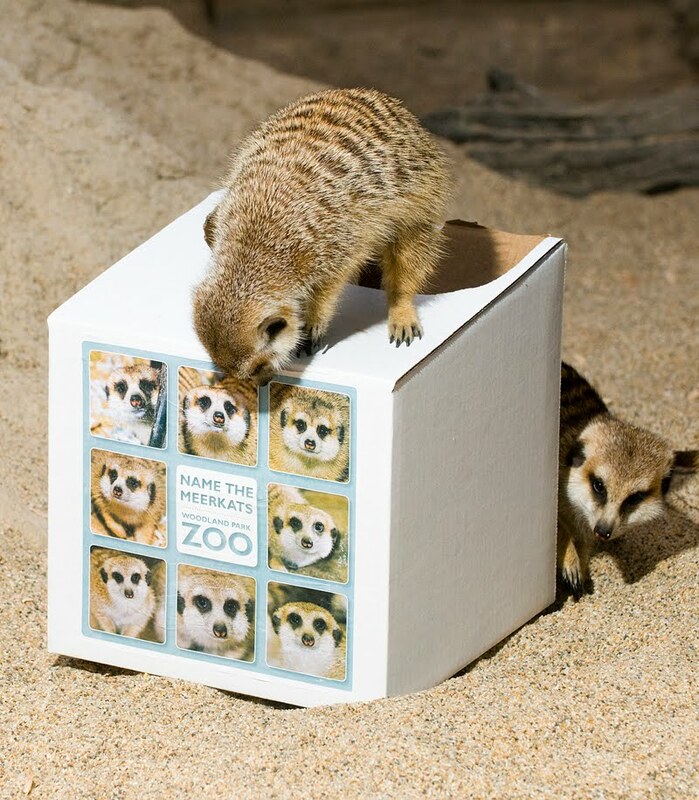 We’re kicking off a meerkat naming contest today and the mob got in on the fun by “casting” the first votes (which mostly involved them exploring and playing with a ballot box!). Now it’s your turn. 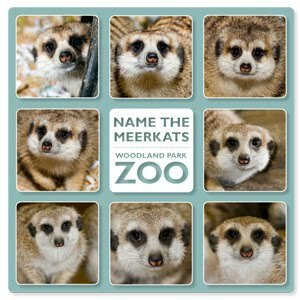 Our “Name the Meerkats” contest, sponsored by U.S. Bank and The Seattle Times, starts today with an awesome grand prize of a trip for four to San Diego! 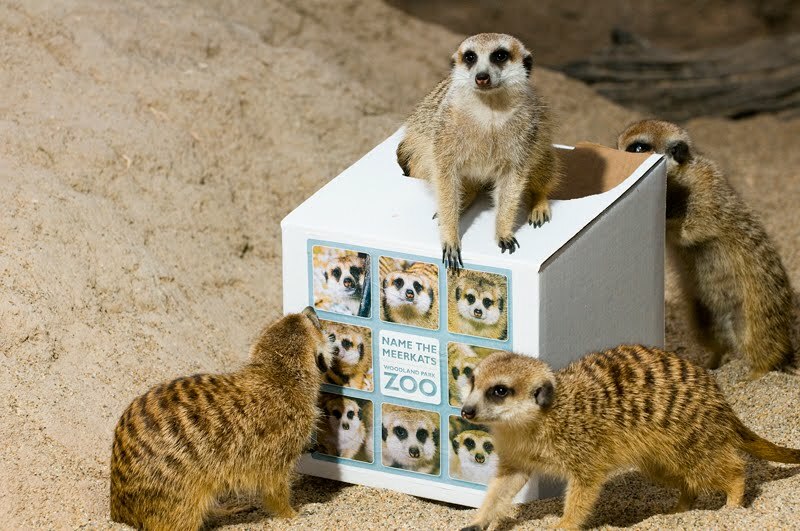 We’ll announce the eight most voted meerkat names and prize winners on July 1 at Red, White & Zoo when meerkats will enjoy a special watermelon treat as part of our annual Independence Day-themed enrichment event. Happy voting! *Get the full details on contest rules and eligibility.